Yerevan (AFP) - Armenians on Sunday voted in a referendum on constitutional reforms which the opposition claims are aimed at keeping the ex-Soviet nation's President Serzh Sarkisian in power. If endorsed, the constitutional change proposed by the pro-Russian leader will transform the Caucasus country's system of government to be one led by a prime minister, not a president. Under the proposal, there would still be a president in a ceremonial role, elected by parliament and serving a term of seven years instead of the current five. The opposition alleges that the initiative is aimed at allowing Sarkisian, 61, to maintain his grip on power by switching jobs after he steps down as president when his second term ends in 2018. Some 5,000 protesters already rallied against the reforms in Yerevan on Tuesday, demanding Sarkisian's resignation, and opposition parties vowed to stage fresh protests on Sunday evening. "If adopted, the amendments will perpetuate the rule of Sarkisian and his Republican Party," said Aram Manukyan, an MP from the opposition Armenian National Congress party. The leader of the opposition Heritage party, Armen Martirosyan, complained of "widespread violations" at polling stations and called on Armenians "to take to the streets right after the voting ends." He said the voter lists were flawed and claimed that voters were being "either bribed or intimidated". 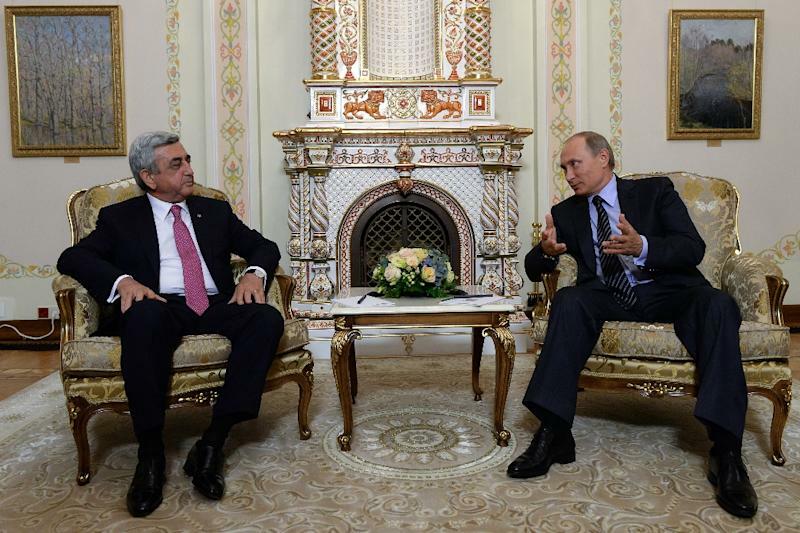 On Thursday, Sarkisian refused to repeat his earlier pledges not to run for any government office after his second and last term as president expires. "The changes will make cooperation between different branches of government more effective... and facilitate economic development and the protection of human rights," he said ahead of the vote. Sarkisian's ruling Republican Party has also defended the reforms, saying they would empower the opposition. "If the amendments are accepted, Armenia will have a stronger parliament and a stronger opposition with serious leverage for influencing decision-making," senior Republican Party MP Margarita Esayan told AFP. The Venice Commission, an advisory body of the Council of Europe rights watchdog composed of independent experts in the field of constitutional law, has said the reforms will be a "further important step forward in the transition of Armenia towards democracy." At a polling station in Yerevan, 72-year-old pensioner Sargis Aslanyan told AFP he had voted against the changes "as the whole thing is just about power-thirsty politicians clinging to their chairs." "People need jobs, not a new constitution," he said. Another voter, 28-year-old shop assistant Tatev Kirakosyan, said she "voted 'yes' because whatever could be done to improve the situation in Armenia must be welcomed". A simple majority of at least a quarter of Armenia's 2.5 million eligible voters is required for the amendments to pass. Voter turnout was 50.51 percent when polls closed at 1600 GMT. A shrewd former military officer, Sarkisian has been president of the small landlocked nation of 2.9 million since winning a vote in 2008 that saw bloody clashes between police and supporters of the defeated opposition candidate in which 10 people died. He won a second term in 2013.